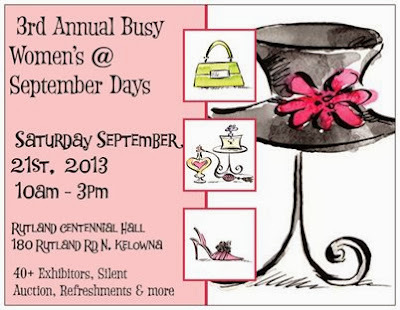 It's a Vendor Fair in a suburb of Kelowna and it will be a busy and big one. I wanted to share with you a couple of things I made for the fair, besides the 80 or so cards I have for sale. I donated an item for the Silent Auction - a pack of five hand stamped greeting cards and a gift certificate. I remembered at the last minute that I needed a case for my cards and I was tempted to panic, but instead put my brain into logical gear and set out to find something quick, easy but very cute! Almost immediately, I thought of the Thankful Tablescape Simply Created Kit (133463)! The napkin holders and those cute place cards and chalkboard labels, not to mention the White Stampin' Chalk Marker! Isn't this a great holder! And it took all of 7 minutes to get together. Below you can see the cards it contains! Hopefully, it will be a hit for the auction! And I wanted to make some business cards that wouldn't get lost in some one's purse or wallet, or worse! So I created these cute magnetic business cards for the fridge. I used magnetic sheets from my local office supply store and punched out some 1 3/4" circles with the punch (119850) of the same size. I added some Designer Series Paper Stack flowers, punched with the Blossom (125603) punch and the Fancy Flower (118073) punch, curled the petals with my Bone Folder and adhered them to the magnetic circle. I printed some 1 3/8" circles with my info on them on some sticker paper and punched them out with the 1 3/8" Circle Punch (119860) and removed the backing and stuck them on. I added a variety of embellishments, and we're done! Cute, aren't they? And if they go on the fridge, people will likely look at them and think about me and Stampin' Up and little longer than with a regular business card! I'll let you know how it went, but just remember that if you want to enter the draw for the BLOG CANDY I'm giving away, you must write a comment on that post by 8 pm tonight, when I will do the draw! Just follow the link. If you are in my area, be sure to come out and shop! 40 + vendors so you can do all your shopping in one place! See you there!